Fall is coming in hot (or maybe I should say cool?!) and it’s bringing with it football season. While I’m all about some shareable snacks, I’m not a big beer drinker, and now that we’re talking about it, I’m not a big football girl either. But give me some wine, cheese and a relaxing afternoon with friends and I’m so game. Naturally, as you can imagine, pairing wine with things like wings and nachos is just not delicious. So, inspired by a recent discovery, Garnacha wines, and the upcoming #GarnachaDay, I came up with a snack that is perfect to share with sips and pals. Garnacha, which originated in Spain but can now be found in France, Italy and the US, are actually one of the oldest and most planted grapes. Fun fact: Garnacha is the only variety in the world that is able to produce both red and white wines. How cool is that? And not only that, but they also produce a variety of wines ranging from dry to sweet, meaning no matter the celebration or time of year, this versatile wine (with a very affordable price point ranging from $10-$20) will have something to fit your needs. Because of the assortment of flavors found in this multipurpose wine, I wanted a tapas dish whose tastes were all encompassing. Of course, I couldn’t help but be inspired by Spanish food (as they say, when in Rome, er when drinking Spanish wine…), so I thought of a way to combine some of my favorite traditional Spanish flavors in a not so traditional, but oh so delicious, way. What I have now dubbed ‘Spanish Nachos’ start with a layer of crispy homemade potato chips, which are then piled high with chorizo, Iberico cheese, green olives, capers and a few other yummy things. While it’s certainly not customary, to either Spanish cuisine or typical nacho recipes, it’s a attractive, appetizing dish that is perfect for sharing with friends. 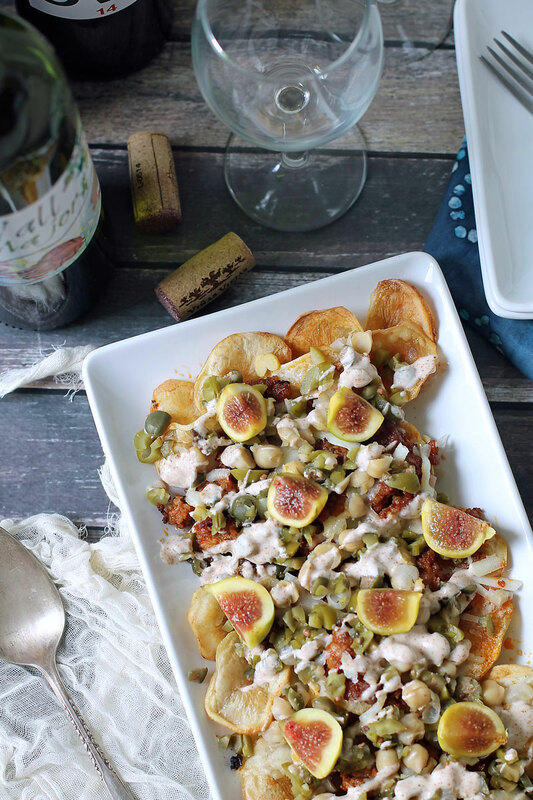 So grab a bottle of Spanish Garnacha wine (two of my favorites are the Punto Y Seguido and the Terrai OVG), make yourself some Spanish nachos, and in true Spanish tapas style, grab some friends and get to sipping and sharing. To make the potato chips- Peel and thinly slice each potato. Place in a large bowl and cover with lukewarm water. Allow them to sit for about 30 minutes, then drain and rinse in a colander several times. Leave the potato slices sitting in the colander for approximately another 30-60 minutes. Once the slices have drained, preheat your oven to 375 degrees. Lay the slices out in a single layer on an unlined, but lightly greased, baking sheet (you’ll either need two baking sheets or you’ll have to bake the chips in batches as you’ll have too many for one baking sheet). Drizzle with olive oil and sprinkle with salt, then begin baking. After 10 minutes, flip them over, then continue baking for about another 10 minutes, or until the chips have turned golden brown and crispy. While the chips are baking, it is a perfect time to sauté the chorizo, grate the cheese and chop the other ingredients, if you haven’t already done so. It’s also a great time to mix up the sauce by stirring the yogurt and paprika together in a small dish. Once the chips have finished cooking, sprinkle the chorizo and cheese on top. Place them back in the oven for about another 10 minutes, or until the cheese has melted. At this point you can either leave the chips on the baking sheet or transfer them to a serving dish. Top them off with the chickpeas, olives and capers. Then drizzle with the yogurt sauce and finish with the figs. Serve immediately. The chips can be made up to 24 hours in advance. Just store them in an airtight container and then reheat them on a baking sheet at 350 degrees for about 5 minutes before adding on the toppings. The yogurt sauce can be made in advance and stored in an airtight container in the fridge.